The reality of what they accomplished still hasn't fully set in. 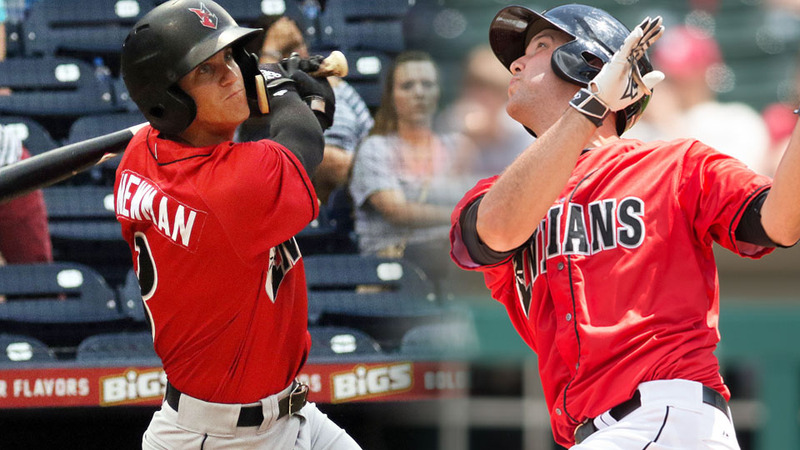 When Kevin Newman and Jacob Stallings hit for the cycle during the same inning of the same game on Aug. 7 at Victory Field, the duo did something that has never been done in the recorded history of professional baseball -- Majors or Minors. The cycle has never received the same love or garnered the same attention as the no-hitter. Due to the sheer volume of Minor League games -- upward of 10,000 are played each season -- both achievements are far more common on the farm than in the bigs. There were 27 cycles and 21 no-no's among domestic affiliates in 2018. Compare that to the Majors, where there were five cycles -- two by Christian Yelich -- and three no-hitters this season. Despite the higher frequency in the Minors, hitting for the cycle remains one of baseball's most challenging achievements. Doing so in the same game travels beyond the realm of rare. But in the same inning? "Looking back on it makes you go, 'Wow, this was a real baseball moment,'" Stallings said. "It's difficult to put into words. I really don't think it's something I'll be able to really appreciate until I'm done playing. As a competitor, when I'm on the field I'm focused on the now and trying to get better. You don't really look too hard at those moments at the time, however special they are." For Newman, the cycle proved to be fitting bow on a solid Triple-A season -- he was called up to the Majors on Aug. 16 after hitting .302/.350/.407 in 109 games for Indianapolis. The 25-year-old set career highs by scoring 74 runs and stealing 28 bases on his way to both Midseason and Postseason All-Star honors. "There was a lot of publicity for us because of how rare it is," said the No. 6 Pirates prospect. "We went on talk shows and did some of interviews. For fans, players and those who appreciate the game, I think it carried extra meaning because of how unique it was. It was a cool thing to be a part of." Both players doubled in the first inning off Lehigh Valley starter Cole Irvin, Philadelphia's 10th-ranked prospect. Newman singled in the third and Stallings went deep in the fourth to give Indy a 2-0 edge, but it was the sixth inning where a real shot at history began to take shape. Newman tripled the previous frame and when Stalling singled during the Indians' six-run sixth, both players were on the precipice of doing something done just once before. Entering 2018, there had been no known instance in either the Majors or the Minors of teammates hitting for the cycle in the same game. In fact, only twice in Major League history had players cycled on the same day: Bobby Veach of the Detroit Tigers and George Burns of the New York Giants on Sept. 17, 1920; and Stephen Drew of the Arizona Diamondbacks and Adrian Beltre of the Seattle Mariners on Sept. 1, 2008. That changed less than a week into the 2018 Minor League season, when Jalen Miller and Gio Brusa both cycled for Class A Advanced San Jose on April 11. Newman needing a homer and the slow-footed Stallings a triple only added to the intrigue and level of difficulty for both players. With three roundtrippers entering the night and 14 across 387 career games, Newman's penchant for the long ball was anything but strong. The home run ball is simply not a regular part of his offensive skill set. The second baseman had his first opportunity in the sixth, but he settled for a two-run double and a fourth hit, which matched a career high. "I knew what was going on those last two times up," the Poway, California native said. "With the lead we had, I felt more comfortable trying to go deep, knowing that's what I needed, but I ended up grounding a ball down the line for the double [in the sixth]. It was obviously a good result, but I quickly realized that trying to hit a home run wasn't the way to do it." Given a second chance in the eighth, Newman cashed in, taking IronPigs' reliever Jake Thompson over the left-field fence to put his name in the record books. In doing so, he became the first Indianapolis player to hit for the cycle since Josh Bell on April 22, 2016. It also gave him a career-high five hits to go along with three RBIs, two runs scored and 12 extra bases. One cycle down, one to go. "I went with a different approach," Newman said. "I was looking for a pitch up that I could drive. I got one, put a good swing on it and luckily it went out. Once I hit it, I took off and kept watching as I was going around first. When I saw it sneak over the wall, I was pretty hyped up." A strikeout and a walk later, it was Stallings' turn. With five career triples over parts of seven Minor League seasons and none since 2015, the 28-year-old catcher -- by his own admission -- needed a minor miracle. And then he got one. "I definitely didn't think I'd hit for many cycles in my career," Stallings said. "As I left the box, I was just hoping it wouldn't get caught. [IronPigs right fielder Ryan Goins] just missed it, but because he was running so fast, he overran it. When I saw [center fielder Collin Cowgill] having to go after it, I was all in for the triple. We were up big at that point, so I figured, 'If I get thrown out, I get thrown out.'" "My teammates all knew what was going on that inning," Newman said. "I was pretty hyped for my own at-bat, and when Jacob came up a few batters later needing that triple, we were all pulling for it. We saw that ball hit the gap and it was like an immediate feeling of déjà vu for me. All of us were screaming, 'Go, go, go!' It's safe to say he's not the quickest guy, but if he had stopped at second I think all of us would have torn his head off." Stallings was also quick to compliment his teammates for their support. "They were all happy for us. It was great," he said. "We were all so pumped when Kevin homered, and the guys definitely were behind me, too. That's why you play sports. You get to enjoy those types of moments with your teammates, which is one of the best parts of the whole thing." Although Newman, Stallings and the other players knew what was at stake, the same couldn't be said for their manager, Brian Esposito. "I've got to be honest, I really didn't know what was going on," Indianapolis' first-year skipper said. "I knew both guys were having good games, but when Kevin hit that homer everyone sort of lost their minds. I know he's not a guy that hits a lot out, but I couldn't exactly figure out why the reaction was what it was until I heard one of the guys mention he cycled. "With Jacob ... that was something else. He was running like I've never seen him run before. When he was going around the bases, I thought to myself, 'Don't tell me he's a triple shy. Is this really happening?' But it was a great thing to witness and be a part of. Both guys deserved it." A byproduct of the dynamic duo's achievement was an unexpected call from Cooperstown. As a known first in pro ball, the National Baseball Hall of Fame asked for and received the lineup card from that night's game. Newman and Stallings had similar reactions when hearing how a memento of their efforts landed in baseball's most hallowed ground. "It was pretty cool to find out about that," Newman said. "I don't think either Jacob or I realized the rarity of what we had done at the time. Right after it happened, you think to yourself, 'I don't think I've seen that before,' but hearing that the Hall of Fame asked for the lineup card put it into perspective for us. To be a piece of Cooperstown is an amazing honor. I'm glad that Jacob was the guy I was able to share the moment with." "For me, that was the moment when it began to set in what we had done," Stallings said. "After we're done playing, we can take our kids [to Cooperstown], take a step back and go, 'Wow, this actually happened!' It's something really, really cool we were able to do." Even Yogi Berra would have had a hard time believing what he saw the night of Sept. 10 at Whitaker Bank Ballpark. That's where Class A Lakewood staged one of the more improbable and exciting rallies in recent memory, earning the fan vote for Game of the Year. Held to one hit through eight innings and trailing by five runs in the ninth, Josh Stephen and Jake Scheiner opened the frame with singles before Rodolfo Duran connected for a three-run homer. Phillies No. 7 prospect Jhailyn Ortiz followed with a solo shot and No. 29 Nick Maton blasted the equalizer six pitches later with the BlueClaws' third consecutive homer. Madison Stokes' two-out RBI single in the 11th scored Duran with the go-ahead run to cap the win. Making the comeback even more remarkable was a recent power outage by Lakewood, which began the ninth with one home run through 25 postseason innings. Duran, Ortiz and Maton hit three in a span of 12 pitches. "We've been doing this all year," Maton told MiLB.com after the win. "Never once have we just quit or given up. Stephen comes in and gets a leadoff single, and then Duran hits a three-run [shot] and we're like, 'We're in this now.' All of a sudden, Ortiz hits a home run and we're one swing away from tying it, and it happened. It was crazy, man." Lexington would get the last laugh, however, rebounding from the historic Game 1 setback to win three straight en route to its first SAL championship since 2001.